Peter Egan is a British actor who is perhaps best known for his roles in the hit TV shows, ‘Downton Abbey’ and ‘Unforgotten’, but also of course, ‘Ever Decreasing Circles’. He is currently starring in a new BBC comedy, 'Hold the Sunset', alongside Alison Steadman and John Cleese. Anyone who follows his activities on social media will know that animal welfare is a topic that he feels extremely passionate about and this is was never more obvious than when he was awarded an Honorary Doctorate from the University of Winchester last year for Ethics and Social Justice. He is a patron of the organisation, For Life On Earth and we were delighted to have the chance to speak to him about dogs, animal welfare and a whole lot more. Hi Peter! Thanks so much for taking the time to chat with us today. Do you have five dogs? Please tell us all about them. Okay, let’s start with Pippa because she has just walked into the room. She’s a biscuity-blonde Staffie cross. We’ve had her for eight, going on nine years. My wife, Myra spotted her and she looked so frightened. She was in a pound and had 24 hours left. It’s that terrible ticking clock syndrome that you have in the pound, so I said, ‘let’s foster her’. At the time we had four dogs, so she came on a temporary basis originally but of course, after two minutes I fell in love with her and she’s been here ever since. She’s the most adorable, gorgeous dog. Next we have Megan. She is a full Staffy and she’s a puppy farm survivor. When we got her, her teats were still full of milk and she had been overbred. She was so terrified that if anyone raised their voice, she would wet herself. She was deeply disturbed and frightened. It took us about two years for her to really settle and trust us. She’s totally in love with Myra and follows her everywhere. Staffies are fabulous dogs, aren’t they? Yes, they’re amazingly devoted dogs. After Megan we have Boo. Boo is a black Staffy cross, possibly with a Labrador. She has a wonderful mix of the Lab appetite and the Staffy devotion and we rescued her from All Dogs Matter. You’re involved in All Dogs Matter, aren’t you? I am. They’re a wonderful charity. I’ve been a trustee and chairman for the last nine or ten years and I’m very proud to be a part of it. They’re a remarkable group of people. They’re a great rescue, we know them through dogsblog.com. Next is Cassie and she’s probably nine or ten years old. She’s a rescue from a puppy farm and just the most adorable dog. When we first got her she had a distended stomach and we thought she was eating too much but it was because she wasn’t being fed before she came to us, so she had the sort of swelling you get when you’re starving. She’s been food obsessive since we got her. Every time we feed her she jumps and barks. She’s not aggressive, just obsessive so I think that’s a hangover from her puppy farm days. And finally, we have Tidus. We rescued him from Saving Suffering Strays Sarajevo and this was our first connection with Milena Malesevic, who runs the rescue and is a remarkable woman. Again, Myra spotted him and she contacted Milena. She told me that Milena was very worried about him because he had been treated very badly so we decided to take him on and we’ve had him for about five years now. He’s a wonderful dog but it took a year to socialise him. Even now, I can’t put a harness on him and he doesn’t come out to the woods with me and the other dogs. We have quite a big garden so he has plenty of room to run around in but he’s so frightened, even still, of being restrained or confined that he won’t even let me put a collar on and I won’t force him. I won’t do anything that makes him upset or anxious. He’s perfectly happy and I am perfectly happy that he’s happy, but I admit that I am sad for him that he doesn’t get the stimulation of smells that the other dogs get in the woods. So that’s our five dogs. We did have seven at one point. Wow, seven! How was that? It was a wonderful challenge. If you’re going to have a pack, you might as well have a pack. We kept saying that we’d have two dogs, then we had a third and then we felt that was unfair on one, so we got four. Then we somehow found ourselves with seven. I think it’s more easily done than not when you see and hear stories of dogs so often in need though. I think if I had more time and more facilities, I would have an animal sanctuary because I just adore them. If I live long enough, that may be a plan for a later time in my life. Around two years ago we moved from North London to Surrey and in the summer just before that, I lost the dog that I call my gatekeeper, DJ. He was a Border Collie cross Spaniel. I had him for 16 years and I called him DJ, short for ‘dinner jacket’, because he had a black coat and a white bib and always looked like he was wearing a dinner jacket. He was a remarkable dog. Even now when I talk about him I get very upset because he affected me profoundly. I understand. I lost my Labrador, Chloe just over three years ago and the same thing happens to me when I talk about her. I think anyone who has a connection with animals will understand, and anyone who doesn’t will think I’m mad, but when I looked into his eyes I saw all animals. I’ve always believed in animal rights and animal welfare. I don’t think you can have one without the other, but somehow with DJ there was an extra special connection. As I say, he became my gatekeeper because he made me understand sentience and that all animals have the right to a life. And that was also confirmed quite profoundly when I went to China for the first time because I’m an ambassador for Animals Asia. Jill Robinson, who is a founder of Animals Asia has a one life belief and the sentiments that DJ gave me about animal sentience were absolutely confirmed for me when I went to their sanctuary in Chengdu and met the moon bears that Jill and her team have rescued and were rehabilitating. He sounds like a very special dog. DJ remains a big part of my life now. You mention having two dogs before you moved. Who did DJ share your home with? His name was Finn, he was a wonderful Lurcher and we lost him just before we moved to Surrey. We rescued him on the same day as DJ from the same shelter, the National Animal Welfare Trust in Watford. It is a great gift to be trusted by dogs and to be in a situation where they share their lives with you and you with them. I’m a great believer in listening to their language. They understand my language better than I understand theirs, but I am beginning to understand more of theirs with their subtle grumbles. Pippa, in particular, is brilliant at guiding me until I get her what she wants – or demands in the nicest possible way - whether it’s something to eat, drink or to go outside. I feel very honoured to be a part of the conversation. It’s a great treat. They’re amazingly clever, aren’t they? They are. I mean, they’re just so far ahead of us in so many things. I’m always fascinated by what they know that we don’t yet know they know. Yes, I know exactly what you mean. And I always think they flatter us with their humour, loyalty and attention. There seems to be a common thread with the type of dog you own or have owned, in that you choose to rescue. How long have you been rescuing for? I was born in the year of the dog and of course, as of now we’re in the year of the dog again, so I feel very centred in my dog-life. I feel at one with them and it takes a lot of time, listening and interaction to get to that point but when it happens it’s the most life-affirming feeling. I know you’ve been actively involved in campaigning for animals quite heavily for some time, but before DJ how involved in animal welfare work were you? Before DJ I, of course, loved my dogs, but I didn’t understand that there was more to life than walking, feeding, sitting down and being kind with them. I knew they were a wonderful addition to the family, but now it is a more mutually independent relationship in many ways. From my dogs I’ve learned to live in the moment. I’ve learnt compassion and forgiveness and I’ve learnt that ego isn’t important. What is important is living a life led by compassion. Until then, I thought I was compassionate, but I didn’t know that my compassion was selective. I think the biggest lesson I learnt from him was not to be selective in my compassion and to look at all animals equally, and that’s why I became a vegan. I think that almost from the moment we’re born so much happens in our life that compassion is educated out of us. If we take it in terms of relating to animals, every child wants to cuddle an animal and the cliché is that if you put a child in a room with an apple and a rabbit, it will eat the apple and play with the rabbit. And what happens is that as we grow older the child has played with the rabbit and then goes indoors and asks, ‘what’s for dinner?’ and the mother replies ‘rabbit, darling’ and so that is the beginning of de-compassioning in a strange way. I think the same thing happens when you extend that out to animals, such as rabbits, birds or hamsters that are being kept in cages. We start developing an ownership in terms of animals that we think is quite acceptable and we don’t realise that we’re becoming selectively compassionate. I see what you mean, so we’re conditioning ourselves to believe that there’s no real difference between a hamster kept in a cage and a bear kept in a cage? Absolutely. We have no right to keep anything in a cage. We wouldn’t like to be kept in one ourselves. The biggest step we must take in life is opening doors to the unknown and relating and caring about something new. Do you think age plays a role in that too? Maybe. It was only when I was 40 that I took the time to say ‘yes we can have a dog’ because up until then I was so busy establishing my career and lifestyle. I regret deeply how late I came to being a vegan and that I was not as compassionate as I am talking about now, so, on the one hand, I do agree that there is a time factor but I think if we had the courage to listen when we were young and if we were not educationally de-compassioned then we would all develop much more broadly, much quicker. There has been talk about expanding the education program to include much more about animal welfare, specifically in relation to interacting with dogs to try and avoid incidents involving dogs and children, so it could be that in time this can happen. Absolutely and I think it’s vitally important to have animal welfare of all kinds on the curricula in schools. It’s very, very important for all families to realise that dogs are for life and that they are family members. The things I encounter on a weekly basis at All Dogs Matter when I see people bringing their older dogs in because they no longer suit their wallpaper is absolutely appalling. I do really firmly believe that animal welfare is the issue of this century and if we don’t start addressing it, stopping the war we’ve waged against all species then we will destroy the planet. I think we must rethink the whole Victorian attitude we have towards animals and ownership. Zoos should not exist, we should only have sanctuaries. There should be no animals in entertainment at all. I am against all animals being used in any area of our world that’s there just for the benefit of humans, such as horse racing. How do you feel about Crufts? I’m afraid I can’t relate to it at all. It is about the business of animals and how you develop certain breeds to be showcased each year. I think there should be a street dog version of Crufts, one that is not all about having the perfect pedigree with fluffed up hair. I like dogs to be dogs. Where does your love of dogs come from? Did you grow up around them? I did. We had two dogs. My childhood was chaos (laughs). My father’s side of the family are all Irish and came over from Dublin in the 1930s and almost the whole family congregated in one house in North London. My father’s family were Roman Catholics and then my father met my mother who was an English Protestants and for some reason, they decided to get together. So, there was my English mother married to my Irish father living in a house in which she was the foreigner amongst these lunatic Irish people (laughs). And within the chaos of 14 or 15 people living together, we had two beautiful dogs. One was a chocolate Labrador and the other was a black Welsh Border Collie called Bobby. My first real relationship with a dog was with Bobby the Collie. I remember him quite vividly. I was about five at the time and he was absolutely mad. He would run between my brother and I up and down the stairs and out of the front door. It sounds like he was a lot of fun. We’ve spoken a little about some of the animal welfare campaigns you’ve been involved in and we know Tidus has led you to a fairly big project recently, so let’s go back to DJ and the path he started you on which has led you to becoming a vegan. Yes, well, 18 or so years ago I wasn’t a vegan. I became a vegan three years ago but I gave up eating meat around eight or nine years ago after watching a film called ‘Earthlings’. Before then I was quite a big meat eater. Although I feel quite embarrassed about it now, I used to cook a leg of lamb most weeks and at the time I really didn’t connect the piece of meat with the animal it came from. For some reason, I think I had decided to put my emotional and internal house in order and I decided to watch ‘Earthlings’. I was so shocked by the brutality and lack of respect and compassion these animals experience, and the true cost they pay to end up on someone’s plate that I watched the film in one go. I literally couldn’t speak for three hours afterwards, it hit me right in the heart. I haven’t eaten meat since and I will never eat it again. What made you decide to take it one step further and become a vegan? I went to China with Jill Robinson from Animals Asia and by this point, I hadn’t given up dairy. She told me I had to look into it because it was terrible, which I did, and it was, so I decided to go the whole hog. Then, two years ago Kate Fowler at Veganuary said to me ‘you are a vegan, aren’t you Peter?’ and I replied that I was, basically, but every now and again had a piece of cheese or chocolate. She suggested I do Veganuary and it would confirm something for me, so I did and since then I’ve been totally vegan. A lot of the campaigns you’re involved in have awareness and compassion at the heart of them, and I know this connects to the documentary, ‘A Dog’s Life’ that you have recently filmed with Milena at Saving Suffering Strays Sarajevo. The film launched in Brussels to an audience of MEPs and it was very well received. Where do you hope it will lead to? I hope it will lead to greater awareness of the desperate problems facing stray dogs in Eastern Europe, from the Balkan Peninsula to Croatia and Russia, where thousands of stray dogs face being put to sleep because of the FIFA World Cup event taking place this summer. It was a very powerful film and an extremely clever way to tackle the subject, by bringing it to life in front of an audience of politicians who can potentially help to set change in motion. Thank you. Yes, a lot of feedback I’ve been getting from Bosnia is very positive, saying ‘thank you for raising awareness to this problem because it needs addressing’ so I’m certainly going to pursue and support whatever is planned next in the series of documentaries. Another subject, and the reason you very kindly gave time up to meet with us at the beginning of this year with your friend and fellow animal advocate, Ricky Gervais, is your passion for giving a voice to the voiceless dogs trapped in animal testing laboratories. We introduced you to Scarlett, a Beagle who was once one of those dogs and we know it was a powerful meeting for both you and Ricky. How did you become a patron for the science-based campaigning organisation, For Life On Earth? When I became a trustee for All Dogs Matter, I became involved in The Dog Rescue Federation. The goal of which was to join up smaller rescues and give them a bigger voice in the House of Commons. I became a trustee of The Dog Rescue Federation alongside a remarkable man called Andre Menache. He is a vet and very much connected to For Life On Earth (FLOE). We used to take very long car journeys together to meetings wherever needed to try and unite these rescues, so we had many, many hours together to talk. I knew he was very involved in anti-vivisection and he was the first person I discussed the subject with. It took me a long time to realise how outdated and ineffective animal testing is and after long and detailed conversations with Louise Owen at FLOE, I became a patron. I profoundly believe that we have no right to treat these animals the way we have, and we certainly have no right to test on them. Was Scarlett the first dog you have met who was once used for animal testing? Yes, she was. I had seen a lot online, but she was the first dog I’ve met who has been saved from an animal testing laboratory. She’s a beautiful and extraordinary dog. One of the reasons Beagles are chosen to be bred for use as animal testing dogs is because of how docile they are and what I found very sad about meeting Scarlett was that she was quite rightly deeply suspicious about who we all were and distanced from everyone on the day that we filmed with her. It was almost as if she was just putting up with us because she’s so wounded from her past. Yes, I think you can see it in her eyes, can’t you. I hope with time her pain eases. 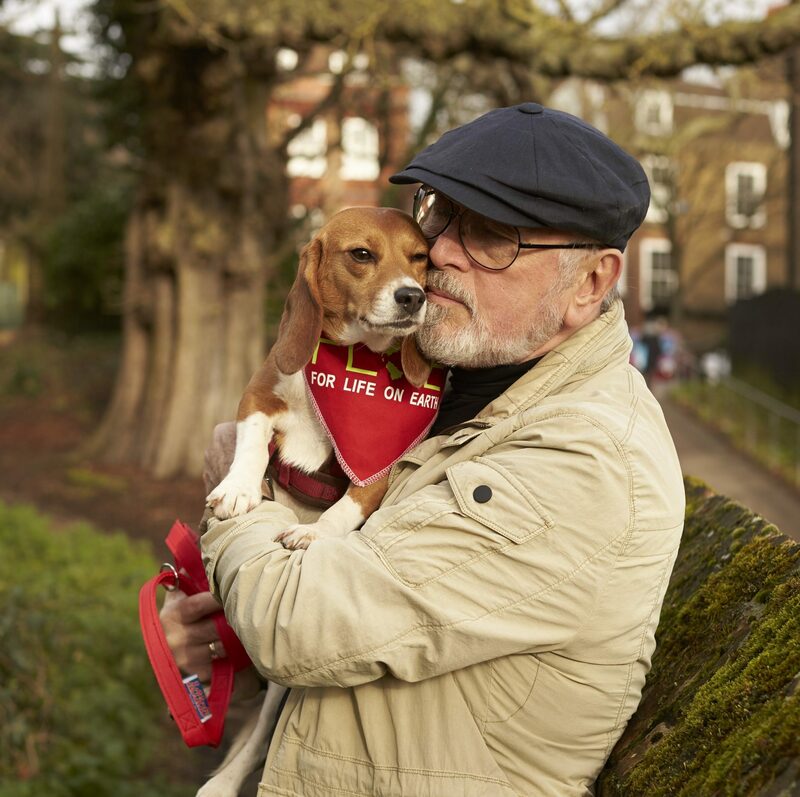 A story we’ve recently run about other Beagles who have been free a lot longer than she has gives me hope on her behalf. We know you are great friends with Ricky. Did his connection with FLOE come through you? It did, yes. He signed the Open Letter we recently sent to Professor Blakemore, but he has been talking about animal testing for many years before he and I met. He is an amazing international figure with such a huge following and he never ever baulks at exposing animal cruelty. Lots of people in his position might protect their social media accounts but what is remarkable about Ricky I think is his great commitment. He is very, very rare amongst international celebrities and as one of the most famous people on the planet, I admire his generosity and commitment greatly. I feel privileged to have him as a friend. He certainly uses his voice and platform well on behalf of lots of animals, so we thank him and you for that. Going back to your own dogs to give them the final word, we have two final questions, Peter, if we may. Please finish the following sentence. My dogs are…a vital part of my life. And one final question, if your dogs could talk and you could ask them one question and one question only, what would you ask and what do you think they would say? I think I might ask them ‘where do you find the capacity you have for forgiveness?’. If I were a dog I would think that the answer might be ‘because I’m aware that humans have a lot to learn’ because I do think we have a such a lot to learn about how we communicate with other species on this planet. And of course, Scarlett, Peter Egan and Ricky Gervais for making time for our photoshoot.